This is a delicious twist on the traditional hotpot. 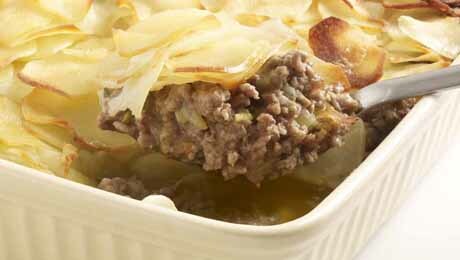 It is like Shepherd’s pie meets hotpot! Begin by finely dicing the onion, garlic, carrot, celery & leek. Heat a large saucepan with a little oil and add in the diced vegetables and sauté on a low heat for 4-5 minutes until they are beginning to soften. Next add in the minced lamb and cook this for 4-5 minutes until the lamb is browned off. Next add in the plain flour and use this to dry up any juices that are on the pan. In a separate saucepan bring the flavoured stock to a gentle boil. Stir the boiled stock into the floured lamb mixture and stir continuously until the mixture thickens, ensuring that no lumps form during the process. Continue to cook for 3-4 minutes and check the seasoning. Add the Worcestershire sauce at this stage if using. Transfer the lamb and vegetable mixture to a medium sized casserole dish at this stage. Next peel and thinly slice the potatoes and arrange these on top of the lamb and vegetable mixture with each potato slice slightly overlapping the previous one. Brush the entire top of the pie with the melted butter, which will give a nice shine and glaze to the potatoes. Transfer the hot pot to the oven for approximately 30-35 minutes until the potatoes are tender and the entire mixture is bubbling.